Remember Barb from Stranger Things, the fan-favorite Velma-meets-Molly Ringwald wet blanket who isn’t coming back? Remember when Winona Ryder and David Harbour found her lifeless, goo-covered body in the Upside Down? Now... remember how it made you hungry? Seeing as how A) Stranger Things is an effective horror show B) cannibalism is taught to humans as being morally repugnant from birth and C) almost nothing is made more delicious by the presence of slime, the answer to that last question is unequivocally “no.” Still, Netflix took it upon themselves to make a slime Barb-inspired French onion soup... indicating that whoever is running their YouTube channel has lost their tenuous grasp on reality. 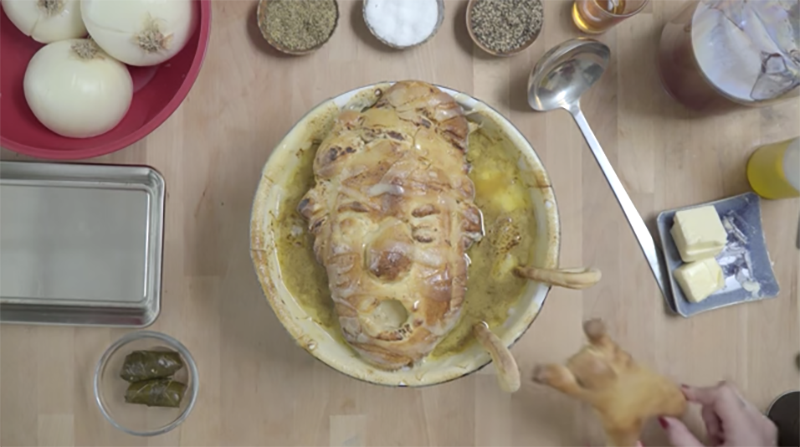 The gist of the recipe, such as it is, involves making a bread face in the likeness of the late Barbara Holland to float on top of the soup and act as a substrate for melted gruyere. A soup that looks at you while you’re eating it—great! There’s also a tiny bread person leaning against the side of the bowl which is... what exactly? Barb at the pool? Someone finding her? It is a mystery, much like why this video was planned, budgeted, shot, edited, and posted to Netflix’s 1.1 million YouTube subscribers. There’s a second video in the “Netflix Kitchen” series so far—a demagorgon pie—but it takes a more impressionistic approach and doesn’t draw inspiration from a teenager’s corpse. Gross. Get it together guys.